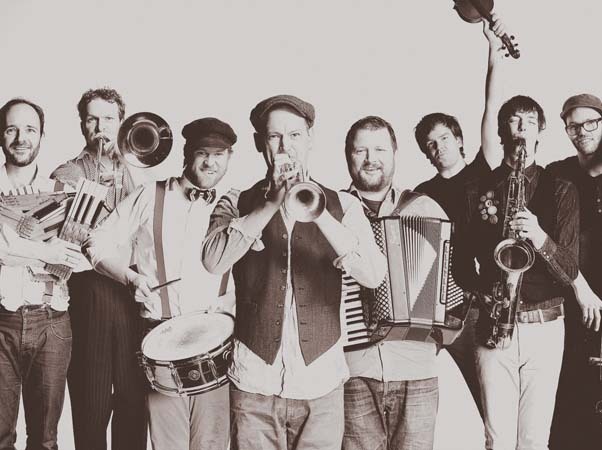 Powerful horns, toe-tapping fiddle and contagious rhythms characterise Habadekuk – one of Denmark’s leading folk bands, guaranteed to get you on the dance floor. With a vibrant mix of folk, rock, salsa and big band jazz, the lively eight-man band catapults old folk melodies into the 21st century. Expect everything from wild polkas and jigs to lyrical waltzes and rough n’ ready sailor songs in an unforgettable live experience. Their debut album “Hopsadaddy” was awarded “Album of the Year” at Danish Music Awards 2011 (Danish Grammys). The band received the “Tradition Award” at the same occasion in 2013. Habadekuk released their latest album Kaffepunch during summer 2014. The album won Folk Album of the Year in December at DMA Folk 2014 and the band also received the prestigious Tradition Award for a second time. The band has wowed audiences across Europe, Asia and Canada. They have appeared at Tønder Festival(DK), Vancouver Folk Festival(CAN), Winnipeg Folk Festival(CAN), Cambridge Folk festival(UK), WOMAD(UK), Sidmouth Folk Week(UK), Celtic Connections(SCO), Calgary Folk Festival(CAN), Mission Folk Festival(CAN), North Atlantic Fiddle Conference(IRL), Guiness Irish Festival(CH) Korrö Festival(S), Festival des Traversées Tatihou(FR), Gooikoorts(B), Sounds of the North(PL), Haukelister Festival(N), Folklandia(FIN), RWMF(MAL), Rudolfstatt TF(D) … and many others.